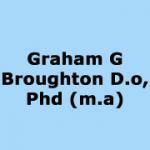 Graham G Broughton D.O, Phd (M.A) based in Nottinghamshire, are professional osteopaths. with a wide range of skills, offering a fast and reliable service. If you are looking for osteopaths in Nottingham then look no further than Sherwood Osteopathic Clinic. We have over 46 years of experience and we offer some of the best functional medicine in Nottingham. Please read on for more information and to see what we can do for you.